After many years of researching your own family history, one of the biggest challenges that remains is this: how can you share your findings with friends and family and in a way that they understand and appreciate? If you've ever pulled out a family tree chart or a research report and have been disappointed at the lack of enthusiasm then you know what I mean. The truth is, that in order to engage others who don't share the genealogy bug, you have to not only capitalize on visual elements such as photos, but take advantage of the latest trend: pinning. Any site that involves "pinning" is basically a content sharing platform which means uploading your own original content OR finding content from others on the site and sharing it (also known as "re-pinning.") The idea of sharing content is not new, but Pinterest and other sites have created visually rewarding platforms that connect users based on what they like to share. Creating an account at the site. Locating original content to share, usually requiring an image of a minimum size in order to be pinned; OR locating content already shared on the site and "re-pinning" to your boards. Adding descriptive text to the content. Pinning or sharing the content. Following other pinners, liking their shared content and leaving comments on the pins. You might be surprised at what you can pin on various pinning sites! Anything that can be pinned should include an image. Why? Well, for some sites like Pinterest, a visual element is a requirement. For others, having a visual element will bring more attention to the pin. Some ideas include family photos, vital records, census records, newspaper articles, obituaries, recipes, and funeral cards. Don't forget about 3D items that you've scanned or photographed, such as military medals or quilt blocks. Family Recipes: Did you grow up eating specific dishes or types of food? Are there family stories related to these foods? Create a general recipe board and perhaps boards for specific holidays or ethnic celebrations. In the descriptive text for each pin, tell the story behind the dish or recipe. Timelines: When you share the story of an ancestor or a family, it can be difficult to fully understand all the details unless they are laid out on a timeline. Use a pinning site to arrange each historical element of an ancestor's life such as birth, marriage, military service and more along a timeline. Include photos and scanned images of documents as well as a brief description of the event. Surnames: Highlight the various ancestors and relatives who share the same surname by creating a board for each family line. Post photos of each ancestor, scanned images of important documents, letters and diaries and even images from their homeland. Photo Albums: Create virtual photo albums on pinning sites and organize images on specific boards such as photos of children, wedding photos, etc. Research Resources: Both individuals and genealogy societies can create boards where the best research tools and websites are pinned so others can take advantage of them. Cluster Research: Pinning sites involving maps are ideal for visualizing cluster research which means grouping research in the same geographic area. Once pinned, you can better visualize migration patterns as well as common areas of engagement such as where ancestors and their neighbors worshipped, worked or lived. Search Engine. Yes, believe it or not, you should be using Pinterest and other social media sites like Facebook and Twitter to search for surnames and place names. You never know what other users are posting on Pinterest and while the content might not be considered a "source" for your genealogy research, a pin can be seen as a "lead generator" that can help you find other resources. Pinterest: (www.pinterest.com) Not only considered the best pinning site, but did you know that after Facebook and Twitter, Pinterest is the third most popular social media site with over 50 million users? The easy-to-use interface and the ability to connect with others makes Pinterest the leader in content curating. Historypin: (www.historypin.com) Imagine taking an image and pinning it to a mapping site like Google Maps? Add a description and then group your pinned images based on themes and you have Historypin. WhatWasThere: (www.whatwasthere.com) Similar to Historypin, WhatWasThere allows you to pin an image to a current address on Google Maps. A neat feature is the "slide" bar which allows you to see the transition from your uploaded historic view to the current Street View on Google Maps. uencounter.me: (uencounter.me) Another Google Maps-based site but with a twist: you upload content, pin it to a map but then you can get notified when other users place a pin within a certain proximity of your pin. Before you start sharing any content on a pinning site, make sure you read the Terms of Service prior to creating an account and understand the rules on pinning your own content as well as the content of others. Pinning your original images and including a copyright statement in the descriptive text. Asking permission before uploading content from others (this is different than re-pinning). Understanding that when you repin content found on the site, you assume that there is no copyright infringement involved. This means that the responsibility is on the original pinner. Use the share buttons on websites and blogs that allow you to pin content to specific sites. Read the Terms of Service. Before you create an account on any pinning site, read the Terms of Services (TOS) and understand what the site can and can't do with your original content. Also understand what other users on the site can and can't do with your images. Upload Your Own Content. 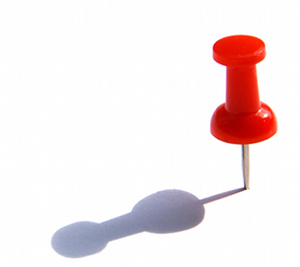 Pin content that you own yourself or that is in the public domain and can be freely shared. Also add descriptive text including, if applicable, a copyright statement. Ask for Permission. If you are sharing images of living people, make sure you get their permission before pinning the content. Let them know where you are using the image and how you are sharing it. Copyright Does Matter. Most pinning sites absolve themselves from liability in terms of copyright infringement and pin that responsibility on the user. Have an Exit Strategy. As with any site where you upload content, have a plan to download or archive your content if you want to remove it. Take Advantage of Share Buttons. When pinning content from blogs and websites, never download the image and upload it as your original content. Always look for sharing buttons for Pinterest and other sites. Pinning your genealogy research won't deflate it or harm it. In fact, pinning your content to sites like Pinterest could actually attract more attention! Have fun uploading your original content and also re-pinning the content you like and that relates to your family history.